Tho doesn’t love family movie night? You can bond, talk about the movies, and, most importantly, have fun. But finding the right movie — something that’s okay for younger kids but that won’t bore older ones — can be a challenge. Sometimes you end up spending more time scrolling through Netflix than actually watching anything. Take stress out of the equation with a whole summer’s worth of ready-to-go movie-night picks! We’ve got you covered with fun, family-friendly movies for every Friday night from June to August. These hand-selected films are popular with kids of all ages (and grown-ups, too). 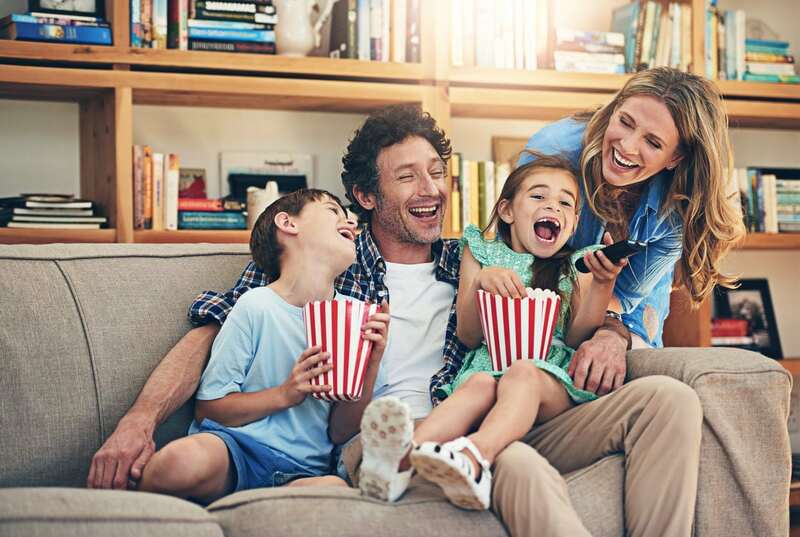 And since family movie night shouldn’t break the bank, all of them are available to stream on either Netflix, Amazon Prime Video, or Hulu or as a video-on-demand rental for $4 or less. If your kids are a bit older — or if you’re looking to have a double feature after the little ones go to bed — we’ve also included a tween-friendly option each week to extend the fun. So enjoy this guide, revisit some old favorites, and discover some new ones with your fam this summer. This charming animated story is unlike any other Disney movie out there. In Hawaii, a spunky, independent girl adopts a dog that turns out to be an intergalactically wanted alien. With strong messages about family and an unforgettable surfing scene, this is the perfect way to kick off summer. Get ready for the upcoming Pixar sequel by watching the vivid, action-packed origin story. “Retired” superheroes Bob and Helen Parr are trying to live a normal life with their superpowered family, until they’re catapulted back into a life of fighting bad guys. The Incredibles’ family dynamics are funny and familiar, even if you don’t have superhuman abilities. This witty, quotable comedy takes traditional fairy tales and turns them on their head. With gross-out humor for kids, satire and innuendo for grown-ups, and an excellent soundtrack, there’s something for everyone here. You won’t remember a time when you weren’t rooting for a grumpy ogre and wisecracking donkey. Change it up a bit with this heartwarming, hand-drawn tale about an unlikely friendship. A hungry bear named Ernest befriends a spunky mouse named Celestine, even though it’s a crime in their respective communities. It’s a lovely film that’s sure to spark conversations about prejudice and discrimination. Even though school’s out, you might want to hit the books after watching this inspiring drama about a tween spelling bee competitor. It’s impossible not to fall in love with Akeelah’s grit and brilliance as she navigates relationships with her family, friends, and gruff spelling teacher. This lively, fun popcorn movie is perfect for a holiday weekend — just so long as you’re not grossed out by poop jokes and potty humor. But you might be surprised to find out that Captain Underpants is as much about friendship as it is about flatulence. That is to say, there’s a lot of both. Even though it’s engaging, clever, and full of heart, this larger-than-life adventure is often overlooked in favor of flashier animated movies. But the touching, thought-provoking story about a young boy and the giant robot he befriends has plenty of excitement and positive messages. What more could you want? Whether or not you loved the classic children’s book about an adventurous bear with a love of marmalade, there’s no doubt that Paddington is a delightful adaptation that stresses compassion and the importance of family. Overall, it’s a sweet, charming movie with all-ages appeal, but watch out for some scares for young or sensitive kids. With vibrant visuals and a moving story, this loving Pixar tribute to the Mexican holiday Day of the Dead will win you over from start to finish. It’ll stay in your rotation long after movie night, thanks to the fantastic music, stunning setting, and strong themes of family. But keep in mind, the skeletons can be a bit scary for little ones. Vikings, dragons, and excellent role models for girls and boys? This is more than your typical fantasy adventure. It seamlessly combines thrilling action, gorgeous visuals, and strong themes of redemption, friendship, and courage. Plus, it’s funny! Moana isn’t your average princess story. It’s exciting, enchanting, empowering, and refreshingly romance free. Courageous “princess” Moana and self-absorbed demigod Maui make a surprisingly great team in this tribute to Polynesian culture. And the songs are so catchy you might actually enjoy them being stuck in your head for weeks. In a world where CGI has become the norm, this charming stop-motion movie about a group of chickens escaping a farm continues to stand out. Parents will definitely enjoy this film as much as kids. It’s wildly funny, incredibly creative, and full of unique, quirky characters. Unlike the other movies based on toys, this one is, well, awesome. Emmet’s journey to become a Master Builder is a joyous, hilarious celebration of imagination and teamwork. The voice acting and character cameos — which range from Batman to Gandalf to Abe Lincoln — are brilliant, and the inventive way the Lego bricks are animated is jaw-droppingly cool. Finish off summer with one of the best family films of all time. Steven Spielberg’s fantastic family drama wrapped up in a science fiction adventure continues to tug at heartstrings. Kids can’t help but feel drawn to Elliot and his touching friendship with E.T. Whether this is your first time watching or your 50th, you’ll love sharing this movie with your family. Frannie Ucciferri is the associate managing editor at Common Sense Media.